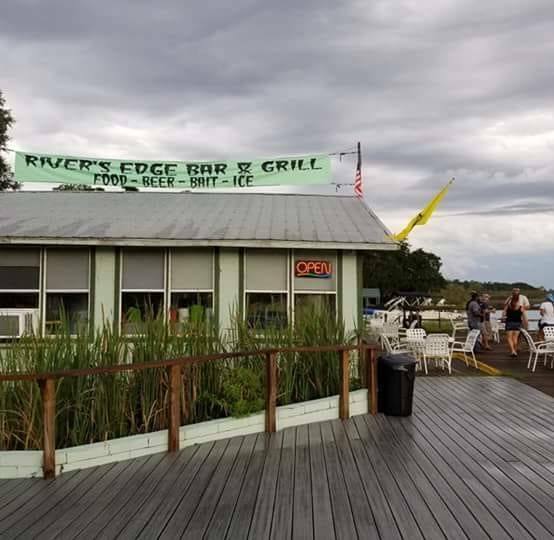 Umatilla — River’s Edge Bar & Grill, located at 19400 SE CR 42, Umatilla, was immediately shut down after an emergency order was issued on January 31 by the state. The restaurant was allowed to reopen on February 1st after a reinspection. The Department of Business and Professional Regulation cites violations of Florida’s sanitation and safety laws, which are based on the standards of U.S. Food and Drug Administration’s Food Code. High Priority violations are those which could contribute directly to a foodborne illness or injury and include items such as cooking, reheating, cooling and hand-washing. Clean glasses, cups, bowls, plates, pots and pans not stored inverted or in a protected manner. Plastic pans on shelf over hand sink. Food being prepared outside. Employees preparing food in fryer and grill on added back patio. Hole in or other damage to wall. Hole in wall under reach in cooler, insulation pulled out from hole. Mobile food dispensing vehicle has lost the ability to remain mobile. Establishment has added a porch to unit containing a grill and a fryer. Porch is secured to side of unit making the unit unable to be moved. Mobile food dispensing vehicle license number not permanently affixed on the side of the unit in figures at least 2 inches high and in contrasting colors from the background of the vehicle. Wrong license number on unit 6251128. Also, no license decal affixed to unit. Single-service articles improperly stored. Bag with food trays on floor. Standing water or very slow draining water in handwash sink, three-compartment sink, or mop sink. Hand sink is draining slowly. Employee began working with food, handling clean equipment or utensils, or touching unwrapped single-service items without first washing hands. Male employee began making a food order without washing hands. Potentially hazardous (time/temperature control for safety) food cold held at greater than 41 degrees Fahrenheit. Chili on front counter 81°. Stop sale issued. Potentially hazardous (time/temperature control for safety) food reheated for hot holding not reaching 165 degrees Fahrenheit for 15 seconds within 2 hours. Beans 110° @ 2:20 in crockpot since around 12:30. Temperature in crockpot increased to speed up heating process. Raw animal foods not properly separated from each other in holding unit. Rolls of raw ground beef over slabs of pork ribs in reach in cooler. Roach activity present as evidenced by live roaches found. Three live roaches on counter near hand sink. Roach excrement and/or droppings present. Around book near hand sink. Also, three live roaches present. Rodent activity present as evidenced by rodent droppings found. Seven dry hard droppings in cabinets under steam table. Rodent burrow or rodent nesting materials present. Under reach in cooler near door to unit, pulled insulation from wall near hole leading to exterior. Stop Sale issued on potentially hazardous (time/temperature control for safety) food due to temperature abuse. On front counter, Chili 82°. No paper towels or mechanical hand drying device provided at handwash sink. Employee provided napkins. Raw/undercooked animal food offered and establishment has no written consumer advisory. Raw animal foods must be fully cooked prior to service. Offers undercooked burger with no consumer advisory. Ready-to-eat, potentially hazardous (time/temperature control for safety) food prepared onsite and held more than 24 hours not properly date marked. In reach in cooler tomatoes from yesterday with no date mark.